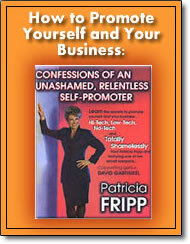 How to Promote Yourself & Your Business: Confessions of an Unashamed, Relentless Self-Promoter – by Patricia Fripp – MP3 download – Discount! Effective self-promotion is the first step to entrepreneurial wealth. Most people don’t have a clue where to start. You’ll learn that plus a whole lot more on this album! Secrets of outrageous success from two of America’s most successful self-promoters! In this special downloadable MP3 audio program (originally 6-cassettes), David and Patricia share practical, little-known secrets that can make you thousands of dollars. This value-packed program contains dozens of secrets! How to make your marketing make money for you! How to create powerful sales letters that make your phone ring! Why some people always have more job offers and business than they can handle- and how you can, too! The 10 Magic Words that turn prospects into paying customers! How success stories can turn one client into 60 clients- and lead you to a client who is worth $10 million! Success-guaranteed market research that doesn’t cost you a dime! How to get an “unfair advantage” in every business situation! Innovative format, part live and part in studio featuring Patricia Fripp and a value added discussion with copywriting genius David Garfinkel!. Garfinkel is President of Overnight Marketing, specializing in direct-response marketing to create rapid, sustained sales gains, consultant to companies on their way to the Inc.100.